Photograph: The new MSUFCU Holt branch will be at 2313 Cedar Street. So when MSUFCU received member requests about opening a new branch in the Delhi Township area, the organization’s leadership went to work searching for the perfect spot. “We want to be where our members are to make their lives easier so that we can serve them better,” said Deidre Davis, Chief Marketing Officer at MSUFCU. The new Holt branch will be located at 2313 Cedar Street, the former home of a Marathon gas station and auto repair shop. The property has soil contamination from the previous owners, making it unsafe for resale and undesirable for redevelopment. But through a partnership with the Delhi Downtown Development Authority, the Delhi Brownfield Redevelopment Authority and the Michigan Department of Environmental Quality (DEQ), MSUFCU will help to restore the once blighted property into a vibrant full-service branch for Delhi Township residents and visitors. 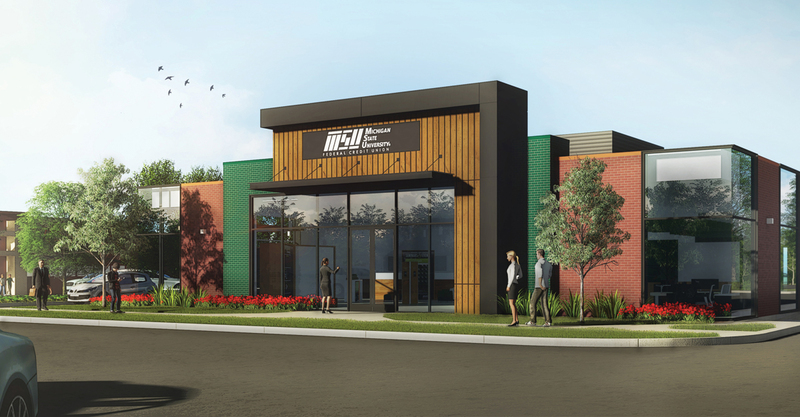 MSUFCU will hold a groundbreaking ceremony for the Holt branch on April 16. Construction will start at full speed early this summer and is expected to be completed by the spring of 2020. The new branch will be unique from MSUFCU’s 13 other locations. Instead of a traditional teller line, where visitors wait to speak with a representative behind a desk, members who visit the new Holt branch will be able to sit down and conduct all of their transactions with one MSUFCU professional who has been trained in all of the different branch services. “They can get everything taken care of in a one-stop shop, so to speak,” Davis said. The Holt branch will also feature a technology bar where members can access the MSUFCU ComputerLine and mobile apps, as well as receive support and training on how to use those digital tools. Children and teens who visit the credit union will have the opportunity to play a variety of financial education games on tablets set up in the lobby. MSUFCU partnered with the Entertainment Learning Lab at MSU to develop apps for different age levels that teach age appropriate financial concepts. “When community members know about their finances, they’re equipped to make better decisions,” Davis said. Member service has been a cornerstone of MSUFCU since the organization was founded in 1937. They are committed to carrying out this legacy today and as they look toward expansion into Delhi Township and future developments.